Waking up in Jerusalem during the Sabbath is like no other city I have visited. This morning, I pulled back the curtains and found that there were no cars in the streets. Shops, on the sides of the road, remained closed and locked. Our first stop, after a cold breakfast, was the settlement of Gilo. The settlement received some media attention in 2009 because President Obama said that its continued construction did not make Israel safer. 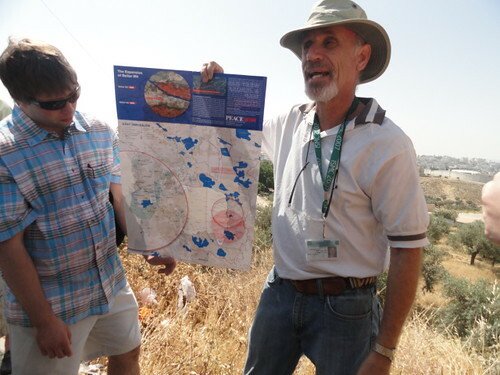 We could see the wall of separation and the Palestinian settlement of Beit Jala. Gilo sits beyond the Green Line but arriving there was just like driving between a neighborhood (no checkpoints or visible security). Also, Steve showed us how the borders have change over the past century. The settlement has a more complex history than many modern countries! 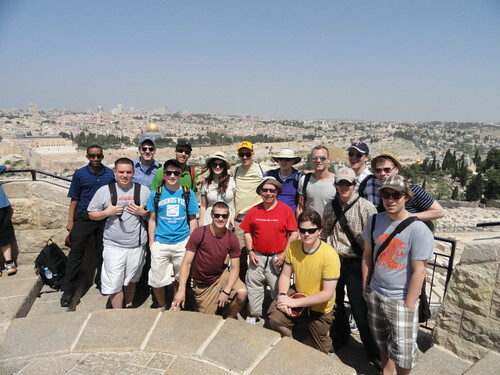 The Mount of Olives was a short ride around the old city from Gilo. The Mount looks across the valley onto the Eastern Wall and the Dome of the Rock. Here is some of our group on The Mount. 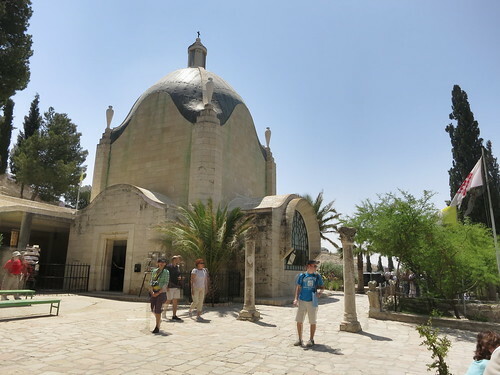 We walked down The Mount to Dominus Flevit Church. The church is built on the place that Christians believe that Jesus cried when he looked across the valley at the Temple Mount and had a vision of its destruction. The shape of the church is a teardrop in honor of the story. After Dominus Flevit, we continued walking into the valley and made a quick stop at the Church of Gethsemane. From there, we walked up the valley (on the Old City side) towards the Lions Gate. Once, inside the Old City we made our stop for lunch. From there we continued, from the Arab Quarter, along Via Dolorosa, towards the Church of the Holy Sepulchre. 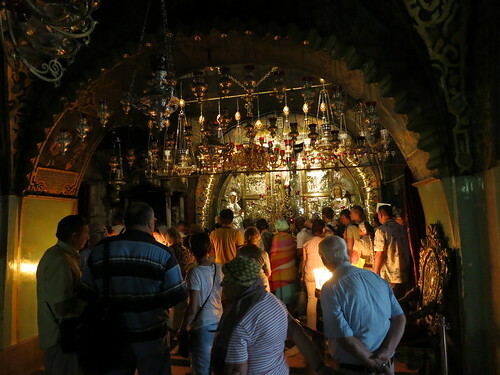 The site is the believed site of Jesus death and burial. Below is the location that Christians believe Jesus was crucified. The church has a deceiving name - rather that one church it is more like a massive complex. Some of these "churches" are only the size of one room. Many of Christian sects have small, adjoining spaces. Some, like the Armenian Apostolic's have churches, many floors down, dug into bedrock. On the other extreme, The Ethiopian Orthodox has church and small village for monks on the roof. The many levels in-between these two are filled with sections for Roman Catholic, Russian Orthodox, Greek Orthodox, Syriac Orthodox, Coptic and many more. In some ways, this mirrored the many sects of Judaism we saw together at the Western Wall. However, again like the Western Wall, the experience is best saved for conversations rather than words or photos. The Bahá'í Gardens, The Western Wall and The Church of the Holy Sepulchre had a mysticism beyond their architecture. In the same way, Israel seems to have its own mysticism in the many successful startups that can come from a country of some of the greatest political, religious and natural strife. It only took a day in Jersusalem to make me wonder how only one-hour away PrimeSense employees could focus on inventing the future. Yet, it is exactly the chaos of the region that makes inventing a new future all the more important.